The Canary Islands, though politically a part of Spain, are only 67 miles from the coast of Morocco on the African mainland. An archipelago consisting of seven major islands, one minor island, and several small islets, all of volcanic origin, they belong to the Macaronesia ecoregion, which also contains the islands of Azores, Madeira, and Cape Verde. Locals call their homeland, "The Land of Eternal Spring," due to its subtropical climate, regulated by the Gulf Stream and Trade Winds. The fact that four of Spain's national parks are located within the Canaries reflects the extraordinary wealth of natural beauty to be found in these islands. As a result of these two factors, over 10 million tourists visit the islands each year. The name "Islas Canaria" is likely derived from the Latin term Insula Canaria, meaning Island of the Dogs, a name applied originally only to Gran Canaria. The dense population of an endemic breed of large and fierce dogs, similar to the Canary Mastiff (in Spanish, el Presa Canario), may have been the characteristic that most struck the few ancient Romans who established contact with the islands by the sea. 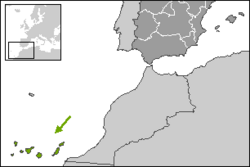 The Canary Islands are included in the Macaronesia ecoregion, which consist of several groups of islands in the North Atlantic Ocean near Europe and North Africa belonging politically to the three countries of Portugal, Spain, and Cape Verde. Macaronesia consists of the four archipelagos of Azores, Madeira, Cape Verde, and the Canary Islands. The Canary Islands were formed by volcanic eruptions millions of years ago, and consist of two groups; a western and an eastern group. The islands of Tenerife, Gran Canaria, La Palma, La Gomera, and Ferro islands make up the western group. This group consists of mountain peaks that rise directly from the deep ocean floor. These islands rise to over 4,000 feet (1,200 meters) at their highest points, with Teide Peak on Tenerife reaching 12,198 feet (3,718 meters), the highest point on Spanish soil. Lanzarote, Fuerteventura Island, and six islets form the eastern group, which surmounts a single submarine plateau, the Canary Ridge, that rises about 4,500 feet (1,400 meters) from the ocean floor. The Teide volcano on Tenerife is the highest mountain in Spain's territories, and the third largest volcano on Earth. All the islands except La Gomera have been active in the last million years; four of them (Lanzarote, Tenerife, La Palma and El Hierro) have historical records of eruptions since European discovery. Regulated by the Gulf Stream and the Trade Winds, the climate is subtropical. There is little seasonal variation in temperature. Precipitation is low, not often exceeding 10 inches (250 mm), except the windward northeastern sides of the islands, where it can reach 30 inches (750 mm) annually. Bird of Paradise on Canary Islands. Fish in submarine depths off Las Palmas de Gran Canaria, Canary Islands. The soils of the Islands are of a rich volcanic nature, and thus support a wide variety of vegetation. The varience in elevation results in a variety of climate zones and a difference in plant life dependent upon that. From sea level to approximately 1,300 feet (400 meters), plants characteristic of hot, arid tracts can be found, and better-watered or irrigated tracts yield crops of bananas, oranges, coffee, dates, sugarcane, and tobacco. From about 1,300 to 2,400 feet (400 to 730 meters) the climate is more Mediterranean, and cereals, potatoes, and grapes are the main crops. A cooler climate exists at higher elevations which supports stands of holly, laurel, myrtle, and other trees. Terrestrial fauna includes geckos (such as the striped Canary Islands Gecko) and wall lizards, and three endemic species of recently rediscovered and critically endangered giant lizard: the El Hierro Giant Lizard (or Roque Chico de Salmor Giant Lizard), La Gomera Giant Lizard, and La Palma Giant Lizard. Some endemic mammals, the Lava Mouse and Canary Islands Giant Rat, are extinct, as are the Canary Islands Quail and Eastern Canary Islands Chiffchaff. The Marine life found in the Canary Islands is also varied, being a combination of North Atlantic, Mediterranean and endemic species. In recent years, the increasing popularities of both scuba diving and underwater photography have provided biologists with much new information on the marine life of the islands. Oratova Valley, view towards Pico de Teide. 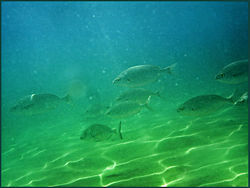 Fish species in the waters surrounding the islands include many species of shark, ray, moray eel, bream, jack, grunt, scorpionfish, triggerfish, grouper, goby, and blenny. In addition, there are many invertebrate species including sponge, jellyfish, anenome, crab, mollusc, sea urchin, starfish, sea cucumber and coral. There are a total of five different species of marine turtle that are sighted periodically in the islands, the most common of these being the endangered Loggerhead Turtle; however, local fishermen continue to take this endangered species. The other four are the Green, Hawksbill, Leatherback and Kemp's Ridley Turtle. Currently, there are no signs that any of these species breed in the islands, so those seen in the water are usually migrating. However, it is believed that some of these species may have bred in the islands in the past, and there are records of several sightings of leatherback turtle on beaches in Fuerteventura, adding credibility to the theory. The islands were known to the Phoenicians, Greeks and Romans, and are mentioned in a number of classical sources. For example, Pliny the Elder describes a Carthaginian expedition to the Canaries, and they may have been the Fortunate Isles of other classical writers. King Juba, the Roman protegee, dispatched a contingent to re-open the dye production facility at Mogador in the early first century C.E.. That same naval force was subsequently sent on an exploration of the Canary Islands, using Mogador as their mission base. When the Europeans began to explore the islands they encountered several indigenous populations living at a Neolithic level of technology. Although the history of the settlement of the Canary Islands is still unclear, linguistic and genetic analysis seem to indicate that at least some of these inhabitants shared a common origin with the Berbers of Northern Africa. The pre-colonial inhabitants came to be known collectively as the Guanches, although Guanches was originally the name for the indigenous inhabitants of Tenerife. There are claims that Portugal had discovered the Canaries as early as 1336, though there appears to be little evidence for this. In 1402, the Castilian conquest of the islands began, with the expedition of Jean de Béthencourt and Gadifer de la Salle, nobles and vassals of Henry III of Castile, to the island of Lanzarote. From there, they conquered Fuerteventura and El Hierro. Béthencourt received the title King of the Canary Islands, but continued to recognize King Henry III as his overlord. Béthencourt also established a base on the island of La Gomera, but it would be many years before the island was truly conquered. The natives of La Gomera, and of Gran Canaria, Tenerife, and La Palma, resisted the Castilian invaders for nearly a century. In 1448 Maciot de Béthencourt sold the lordship of Lanzarote to Portugal's Prince Henry the Navigator, an action that was accepted by neither the natives nor the Castilians. A crisis swelled to a revolt which lasted until 1459 with the final expulsion of the Portuguese. Finally, in 1479, Portugal recognized Castilian control of the Canary Islands in the Treaty of Alcaçovas. The Castilians continued to dominate the islands, but due to its topography as well as the resistance skills of the native Guanches, complete pacification was not achieved until 1495, when Tenerife and La Palma were finally subdued by Alonso Fernández de Lugo. After that, the Canaries were incorporated into the Kingdom of Castile. After the conquest, the Castilians imposed a new economic model, based on single-crop cultivation: first sugar cane; then wine, an important item of trade with England. In this era, the first institutions of colonial government were founded. Both Gran Canaria and Tenerife, a Spanish colony since 1495, had separate governors. The cities of Las Palmas de Gran Canaria and Santa Cruz de Tenerife became a stopping point for the Spanish conquerors, traders, and missionaries on their way to the New World. This trade route brought great prosperity to some of the social sectors of the islands. The islands became quite wealthy and soon were attracting merchants and adventurers from all over Europe. Magnificent palaces and churches were built on the island of La Palma during this busy, prosperous period. The Church of El Salvador survives as one of the island's finest examples of the architecture of the 1500s. The most severe attack took place in 1599, during the Dutch War of Independence. A Dutch fleet of 74 ships and 12,000 men, commanded by Johan Van der Does, attacked the capital, Las Palmas, which was home to nearly half Gran Canaria's population). The Dutch attacked the Castillo de la Luz, which guarded the harbor. The Canarians evacuated civilians from the city, and the Castillo surrendered (but not the city). The Dutch moved inland, but Canarian cavalry drove them back to Tamaraceite, near the city. The Dutch then laid siege to the city, demanding the surrender of all its wealth. They received 12 sheep and three calves. Furious, they sent 4,000 soldiers to attack the Council of the Canaries, who had sought shelter in the village of Santa Brígida. Three-hundred Canarian soldiers ambushed the Dutch in the village of Monte Lentiscal, killing 150 and forcing the rest to retreat. The Dutch concentrated on Las Palmas, attempting to burn it down. The Dutch pillaged Maspalomas, on the southern coast of Gran Canaria, San Sebastian on La Gomera, and Santa Cruz on La Palma, but eventually gave up the siege of Las Palmas and withdrew. Another noteworthy attack occurred in 1797, when Santa Cruz de Tenerife was attacked by a British fleet under the future Lord Nelson on July 25. The British were repulsed, losing almost 400 men. It was during this battle that Nelson lost his right arm. The sugar-based economy of the islands faced stiff competition from Spain's American colonies. Crises in the sugar market in the nineteenth century caused severe recessions on the islands. A new cash crop, cochineal (cochinilla), came into cultivation during this time, saving the islands' economy. These economic difficulties spurred mass emigration, primarily to The Americas, during the nineteenth and first half of the twentieth centuries. From 1840 to 1890, as many as 40,000 Canary Islanders emigrated to Venezuela alone. Many of them stopped and stayed in Puerto Rico, tired of the long journey. Many thousands of Canarians emigrated to the shores of Cuba as well. During the Spanish-American War of 1898, the Spanish fortified the islands against possible American attack, which never occurred. At the beginning of the twentieth century, the British introduced a new cash-crop, the banana, the export of which was controlled by companies such as Fyffes. The rivalry between the elites of the cities of Las Palmas de Gran Canaria and Santa Cruz de Tenerife for the capital of the islands led to the division of the archipelago into two provinces in 1927; the rivalry continues to this day. During the time of the Second Spanish Republic, Marxist and anarchist workers' movements began to develop, led by figures such as Jose Miguel Perez and Guillermo Ascanio. However, outside of a few municipalities, these organizations were a minority. In 1936, Francisco Franco was appointed General Commandant of the Canaries. He joined the military revolt of July 17 which began the Spanish Civil War. 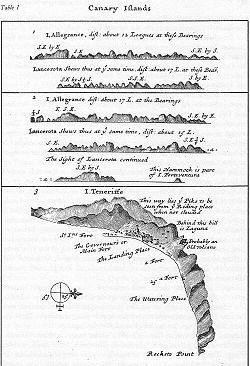 Franco quickly took control of the archipelago, except for a few points of resistance on the island of La Palma and in the town of Vallehermoso on Gomera. Though there was never a proper war in the islands, the post-war repression on the Canaries was most severe. Following the death of Franco there was a pro-independence armed movement based in Algeria, the MPAIAC. There are some pro-independence political parties, such as the CNC and the Popular Front of the Canary Islands, but none of them openly calls for an armed struggle. Their popular support is insignificant, with no presence in either the autonomous parliament or the cabildos insulares. The Autonomous Community of the Canary Islands consists of two provinces of Spain, Las Palmas and Santa Cruz de Tenerife, whose capitals (Las Palmas de Gran Canaria and Santa Cruz de Tenerife) are co-capitals of the autonomous community. Each of the seven major islands is ruled by an island council known as cabildo insular. The international boundary of the Canaries is the subject of dispute between Spain and Morocco. 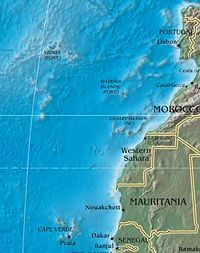 Morocco does not agree that the laws regarding territorial limits allow Spain to claim for itself sea-bed boundaries based on the territory of the Canaries, because the Canary Islands are autonomous. In fact, the islands do not enjoy any special degree of autonomy as each of the Spanish regions, as autonomous communities, exist under the same regulations and standards. Under the Law of the Sea, the only islands not granted territorial waters or an Exclusive Economic Zone (EEZ) are those that are not fit for human habitation or do not have an economic life of their own, which is clearly not the case of the Canary Islands. The Islands have 13 seats in the Spanish Senate. Of these, 11 seats are directly elected, three for Gran Canaria, three for Tenerife, one for each other island; two seats are indirectly elected by the regional Autonomous Government. The Canary Islands economy is based primarily on tourism, which makes up 32 percent of the GDP. The Canaries receive about 10 million tourists per year. Construction makes up nearly 20 percent of the GDP and tropical agriculture, primarily bananas and tobacco, are grown for export to Europe and The Americas. Ecologists are concerned that resources, especially in the more arid islands, are being overexploited but there remain many agricultural resources like tomatoes, potatoes, onions, cochineal, sugarcane, grapes, vines, dates, oranges, lemons, figs, wheat, barley, corn, apricots, peaches and almonds. The economy is € 25 billion (2001 GDP figures). The islands experienced continuous growth during a 20-year period through 2001, at a rate of approximately five percent annually. This growth was fueled mainly by huge amounts of Foreign Direct Investment, mostly to develop tourism real estate (hotels and apartments), and European Funds (near 11 billion euro in the period from 2000 to 2007), since the Canary Islands are labeled as Region Objective 1 (eligible for euro structural funds). Additionally, the EU allows the Canary Island's government to offer special tax concessions for investors who incorporate under the Zona Especial Canaria (ZEC) regime and create more than five jobs. The combination of high mountains, proximity to Europe, and clean air has made the Roque de los Muchachos peak (on La Palma island) a leading location for observation. The Gran Telescopio Canarias, or "Great Telescope Canary Islands," sometimes called GranTeCan, is a 10.4m reflecting telescope and is undertaking commissioning observations at the Observatorio del Roque de los Muchachos on the island of La Palma. 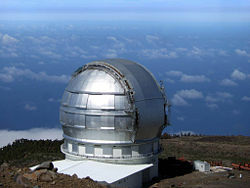 The telescope is sited on a volcanic peak 7,874 feet (2,400 meters) above sea level and took seven years to construct. The GTC Project is a partnership formed by several institutions from Spain, Mexico, and the University of Florida (USA) and an initiative from the Instituto de Astrofísica de Canarias (IAC). The construction of the telescope is estimated to have cost €130 million. The language of the islands is a dialect of Spanish, known as "Canary Islands Spanish." Certain archaic words are used, peculiar to the islands, which show Portuguese influences. ↑ El parque nacional del Teide es el primero más visitado de Europa y el segundo del mundo. Sanborondon.info. Retrieved January 25, 2012. ↑ El Teide (Tenerife) es el parque nacional más visitado de Canarias con 2,8 millones de visitantes en 2008. Europapress.es (2009-08-31). Retrieved January 25, 2012. ↑ Estatuto de Autonomía de Canarias en la Página Web Oficial del Gobierno de Canarias. .gobiernodecanarias.org. Retrieved January 25, 2012. ↑ Official Population Figures of Spain. Population on the 1 January 2009. 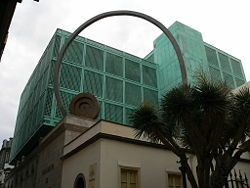 Instituto Nacional de Estadística de España. Retrieved January 25, 2012. ↑ Groombridge, Brian, and Lissie Wright. 1982. The IUCN amphibia-reptilia red data book. Pt.1, Testudines, crocodylia, rhynchocephalia. Gland, Switzerland: IUCN. ↑ C.Michael Hogan. October 31, 2007. Chellah The Megalithic Portal. Retrieved June 14, 2008. ↑ The Applied History Research Group. Sugar And The Conquest Of The Canary Islands Retrieved June 14, 2008. ↑ John M. Lipski. The Spanish of the Canary Islands Penn State. Retrieved June 14, 2008. ↑ Parlamento de Canarias. Canaries Parliament Retrieved June 14, 2008. ↑ CIA World Factbook. Disputes - international Retrieved June 15, 2008. ↑ Encyclopædia Britannica Online. 2008. Guanche and Canario Retrieved June 17, 2008. Crosby, Alfred. 1993. Ecological Imperialism : The Biological Expansion of Europe, 900-1900. Cambridge, UK: Cambridge University Press. ISBN 0521456908. Fernández-Armesto, Felipe. 1982. The Canary Islands after the Conquest: The Making of a Colonial Society in the Early-Sixteenth Century. Oxford, UK: Oxford University Press. ISBN 0198218885. Official Statistics about Canary Islands. Old photos Canary Islands and the Canary Islanders. Canary Islands pose little risk of mega-tsunami. The Canary Islands on Google Maps. This page was last modified on 7 January 2017, at 16:26.